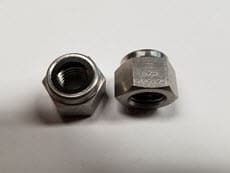 KD Fasteners, Inc.’s Inconel Nylon 600 lock nuts offer excellent corrosion and heat resistance. This nickel-chromium alloy offers good oxidation resistance at high temperatures and good resistance in carburizing and chloride containing environments. When formed into lock nuts, Inconel provides high strength and good workability. The high nickel content of Inconel 600 enables these lock nuts to retain considerable resistance under reducing conditions as well as resistance to corrosion by a number of organic and inorganic compounds. The nickel content also gives Inconel 600 excellent resistance to chloride-ion stress-corrosion cracking and to alkaline solutions. The chromium content of Inconel 600 gives the alloy resistance to sulfur compounds and various oxidizing environments. Additionally, Inconel Nylon 600 lock nuts resist steam and mixtures of steam, air and carbon dioxide. When nylon inserts are added to the Inconel 600 lock nuts, they resist becoming loose due to vibration or shock loading. This addition makes them useful in a large variety of applications. Whether you need a standard or custom size, KD Fasteners has a solution for you. Products are made in the USA. Contact us today by calling 1-800-736-5014 or filling out our contact form.